← Back to the pavement! training again, but the problem was pacing myself. I was doing a good job not running too much but always thinking about it was just as bad as the stress of actually running those miles. It’s been over 2 years since I’ve had an injury serious enough to take me out for an entire month and I forgot what that felt like coming back – a lot of aches and phantom pains. Always in the back of my head for the last month I was thinking – is it healed? I took it real easy for 3 weeks starting at 30% of my pre-injury mileage. My weeks were 30km, 40km, 50k, and finally 60k this week with a race. I knew Brantford Classic was a nice, small local meet that I could place well at. Josh and I decided that I have been overthinking my injury and I needed to race just to see how it feels. This was exactly what I needed. The day before I did an easy 7k shakeout and the nerves were prevalent. 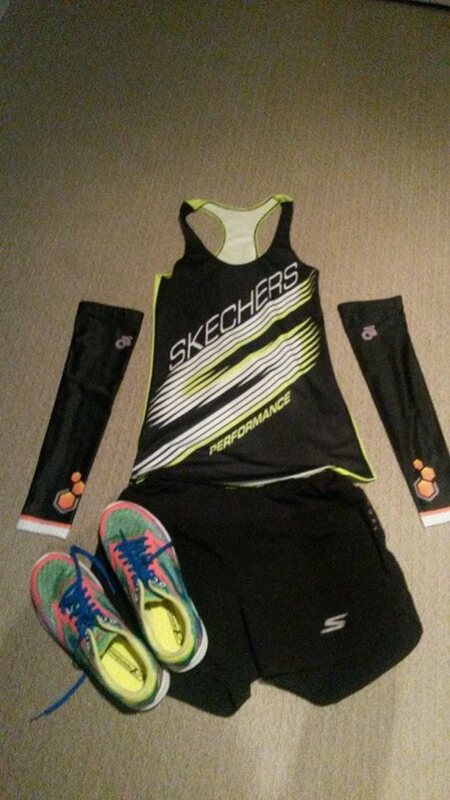 I lined up in my Skechers singlet for the first time, which was exciting along with my new Skechers gear. 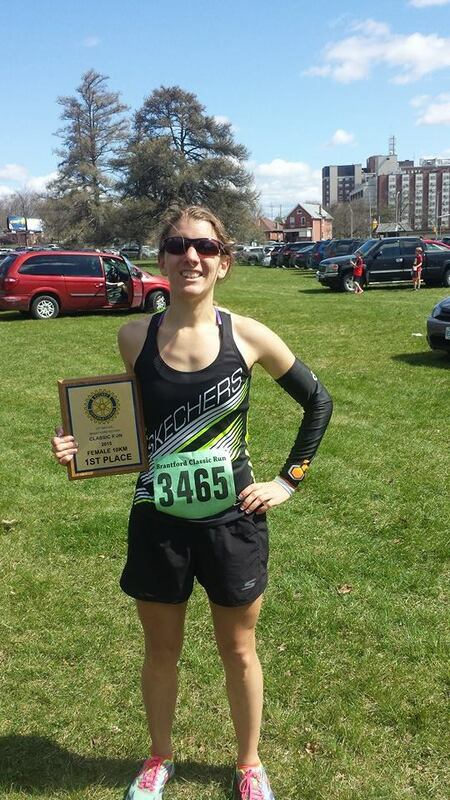 I was super nervous as I added up the months it’d been since I raced – 5. I decided a few days before that my goal pace was no faster than 3:50’s (because I really didn’t want to go out too hard and blow up). I was pretty happy with the first few splits and then at about 3km in I got the worst stomach cramp. I could tell it was from my shallow breathing due to lack of workouts. Unfortunately, that did not go away anytime soon as I saw my splits slow down from 3:50 to 4:00/k. I just told myself to keep pushing, I had been in 4th overall for most of the race now and knew no one would be challenging me for top female, so I took comfort in that. After nearly 5km with a cramp it finally eased up just after 3km to go and I started to pick it back up. Luckily I found my legs because the last part of the course was tough including a steep uphill with a 90 degree right hand turn followed by running over a bridge and a slight incline all the way to the finish. I came across the line 1st female & 4th overall. The race director got me to take a photo with him and the plaque right at the finish, as I tried to catch my breath …I don’t want to see THAT picture. That was not the easiest effort for a sub 40 10k that I’ve ever ran but it was gutsy. I had that cramp but I fought it and didn’t let it slow me much. Keep pushing no matter what always, make the race something even if it isn’t time or placing. 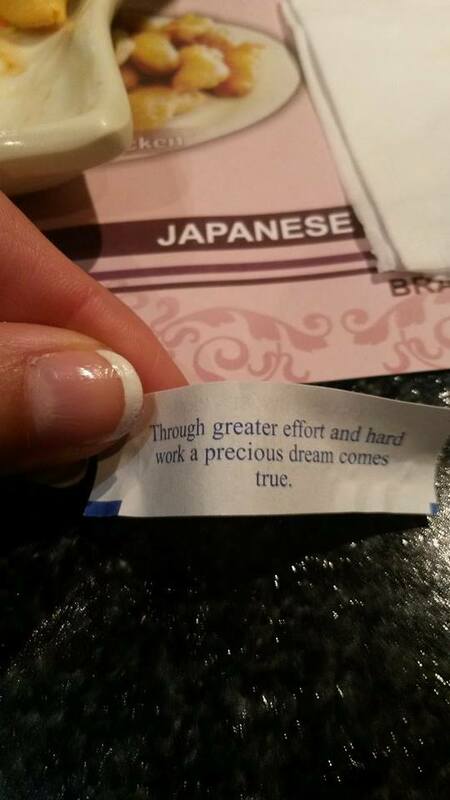 On that note, here’s my fortune from Sunday – Run on! 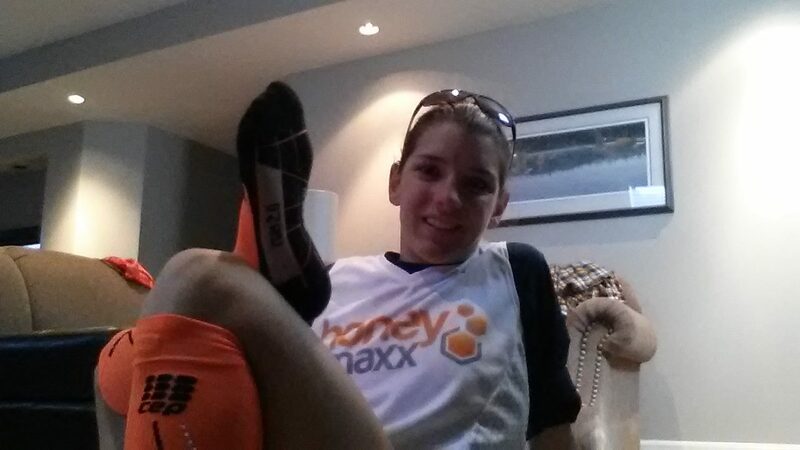 This entry was posted in Brantford Classic, injury recovery, mental skills advice, race recap, running, training. Bookmark the permalink.